What is a "Kwoon"? And how can you fill yours with Qi? 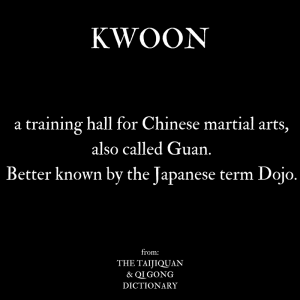 So the kwoon (館) is basically the room where you train Taijiquan and/or Qi Gong. In Pinyin it is actually written as Guǎn and it has some other meanings, e.g. a place for cultural activities or empassy (see Wikipedia). And in the kwoon, you will meet your teacher, who you might call Sifu. Now that the definition of kwoon is clear, I would like to talk about how kwoons look. Or at least how the places I learned Taijiquan and Qi Gong so far have looked like. A room basically empty, with a light wooden floor, white walls. Paravants in one corner formed two checkrooms. There were a couple fo Taijiquan posters on the wall and a small kitchen counter to have a cup of tea (in this place I went to my first Taijiquan classes). The school I currently go to has a nice entrance area with checkrooms and a kitchen counter with tea. In the kwoon itself, there are large windows, almost white walls with large paintings (the teacher is also a Zen artist), some Buddhas, candles and a large cabinet with weapons. I once went to a workshop in an office building, but inside there was a rectangle room with light wodden floor, japanese doors, a cabinet with tea (seems like tea is always a good idea! ), and a corner with meditation pillows. This one looked more like a Zen room or a Dojo. Another workshop was in a barn-like building, the studio being under the roof. It was light, warm and calm. There where Buddhas and other statues scattered in this large room and a lot of yellow and orange fabric draped in various spots. It was a large Qi Gong workshop. Everyone was seated, but it was a really nice atmosphere. But I have also been to other places. Sports hall or gym: these big halls with basketball goas, strange lines on the floor and the worst (in my opinion) is the hall effect. And I am totally aware that sometimes those are the only rooms available, especially for large workshops. However, I find it quite hard to relax under these conditions. I’ve also been to martial arts schools that happen to offer Taijiquan and Qi Gong classes. They are usually dedicated to other, harder martial arts and self defense. I somehow could always feel this hardness. There are often many weapons at display as well as other martial arts equipment. So far, I also found those martial arts studios to be the ones with the stricted kwoon etiquette (find some kwoon rules here). And then there are the most dreary schools. I went to several in almost abandoned (office) buildings. The entrance dark, maybe even moldy. The checkrooms cold or shared by men AND women. The kwoon itself lit by industrial lamps (not the cool ones, the harsh white one!) and cluttered with statues, weapons, mats, chairs. Somehow, I always felt like there was a little cold wind coming through windows and doors. Maybe it’s just me, but I find it much easier to learn, share, and relax in a nice, warm, soothing environment. And then there is another aspect: Feng Shui! I mean, it’s coming from China! I think, if you are serious about the whole Qi-thing and if you work on your internal Qi flow, why not tend to the external Qi flow, too? Especially as a teacher, if you want to attract good students and make it easy for them to learn. Thus if you are a teacher and you have your own martial arts studio: ask a Feng Shui consultant to have a look at it. Improve the energy of your school, just as much as you improve your own energy! And if you are a student and you want to give a Christmas present to your teacher,why don’t you pool with your fellow students and get a Feng Shui consultation voucher! I think that would be a wonderful idea and everyone in the school will benefit from it! What do YOU think about the training hall you currently go to? Where do you feel comfortable? Maybe you even have your own school? Feel free to share your thoughts in the comments below. 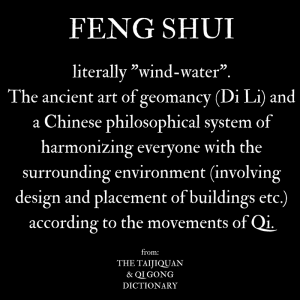 If you are interested in more definitions, have a look at The Taijiquan & Qi Gong Dictionary!